Electric vehicle charging services, also commonly known as electric vehicle charging station or electric vehicle supply equipment (EVSE), is a type of vehicle charging infrastructure that supplies electric energy to charge the battery of electric vehicles. Charging equipment can be differentiated based on charging time and the usage. Globally increasing popularity of the electric and hybrid vehicles as a result of growing environmental awareness is expected to remain the key growth driver for electric vehicle charging services during the period of study. Geographically, Europe dominated the electric vehicle charging services market driven by higher penetration and usage of electric vehicles in the region due to a high awareness towards environment amongst its citizens and a highly developed infrastructure in the region. Europe was followed by North America and Asia-Pacific as second and third largest market for the electric vehicle charging services market. Asia Pacific is projected to have the fastest growth, owing to increasing demand of hybrid automobiles in developing nations such as China and India due to increasing disposable income with majority of people in these nations and growing environmental awareness. This report identifies the global electric vehicle charging services market size for the years 2014-2016, and forecast of the same till year 2022. 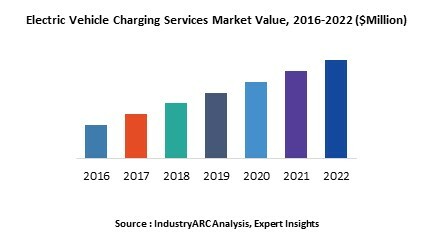 It also highlights the market drivers, restraints, growth indicators, challenges, and other key aspects with respect to global electric vehicle charging services market. 15.12. Leviton Manufacturing Co., Inc.